Xiaomi imported 20,000 units this time and it’s no surprise that the 4th flash sale ended in mere 2.4 seconds. Xiaomi has sold 55 Thousand Mi3 in India in first month itself with last three flash sales lasting 5 seconds, 2 seconds and 2.4 seconds only. With over 150,000 registrations this time as well, many are still awaiting chance to buy an Mi3. Hugo Barra, head of company’s international expansion recently clarified that since Xiaomi has set ahead the manufacturing schedule months in advance and there is not much that they can do to satiate humongous demands. The stock crisis will persist but you can try your luck again on 19th August, registration for which starts today at 6 PM. Xiaomi will also launch the Xiaomi Redmi 1S in India very soon with better preparations and accessories, but we don’t expect this to last any longer either. 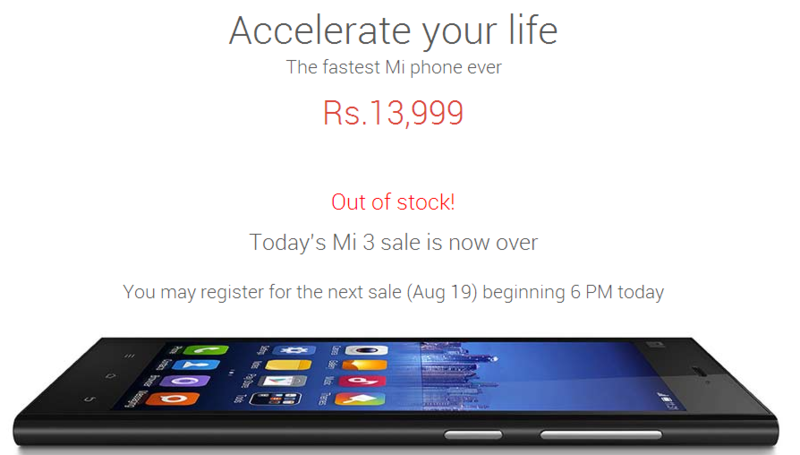 The well known Xiaomi Mi3 brings 2.3 GHz Quad Core Snapdragon 800 beast to a very affordable price range. The chipset includes Adreno 330 GPU, 2 GB RAM and 16 GB internal storage to give you great user experience. Storage is however not expandable. The display is 5 Inches in size with full HD resolution powered by a 3050 mAh battery. Head on to Xiaomi Mi3 full review for better perspective.